Ten days after Phish’s last gig in Spain, they open up their 1997 U.S. Summer Tour at Virginia Beach. 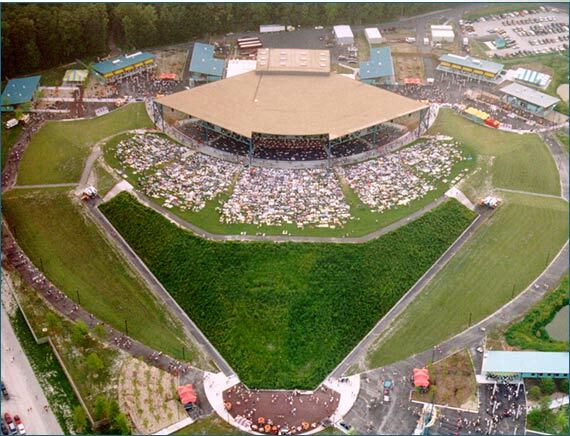 This is Phish’s first gig at the Virginia Beach Amphitheater and they open the show with Ghost. A great first set that you should check out, includes a great Bathtub Gin and some funny banter about the new songs they had just played. After the band fools around with the opening notes, Ghost starts at a pretty slow pace. Page gets into a pretty funky solo that breathes some life into the intro. Not a bad drop in, after a brief pause. Nothing else really stands out, except the fact that it ends quickly and they move right into the jam. The playful spirit from Europe is missing in this intro. Very below average in my opinion. After that short intro the jam starts at 3:18. Trey starts to take the lead pretty quickly. Page is playing very funky, with Mike infusing some funk as well. By 4:45 Mike is really digging into the funk, he and Page have moved out in front. Trey starts to add some funk riffs, and Fishman is providing the pace. At 5:35 Trey moves to solo, he is met quickly with Page making some crazy synth sounds. The crowd erupts to the unique sounds, while Trey continues to move forward. 6:00 min now and Page begins to groove with the synth sounds as Trey absolutely destroys a solo. Mike is still doing a lot of slaps, and the band has found a very cool place. At 6:40 Page moves to the piano. Trey’s playing is in sync with everything going on around him. He is not overplaying but instead feeling the groove. While leading, he is also allowing for exploration from the other four counterparts. By about 6:55 the band is really making some great music. All four are really contributing to a fantastic groove. Let your ear go and it moves back and forth from one band member to another. Page is really filling in the gaps beautifully, definitely my type of jam! At 8:05 you can hear the crowd respond. At 8:15 Trey starts to play a lick a couple times and it looks like the jam is going to be broken down. However, Trey plays a bunch of quick notes and Fishman responds to him. They pick this jam back up and the crowd responds yet again. At 9:34 Fishman plays a quick fill, Trey rips a mean funk lick and the jam starts to go a different way with more cheers from the crowd. Great section! At about 9:40 Trey continues the funk riffs and Gordon starts to lay down the backbone. The jam breaks down and out comes a funky, jazzy groove. The crowd responds immediately. We take the spiraling staircase down into the basement of the funk mansion. At about 10:45 Trey begins a lick and Gordon eventually follows for a measure. Trey then takes it up a bit with Fishman right behind him. 11:18 and Page moves to the piano to add some rain drops into the groove. 11:48 and Trey starts to play with an ambient tone. If you listen close enough you can hear some space loops going as well. Mike and Fishman are really holding things down. Page drops some great texture with his piano countering the dark ambient tone of Trey. Fantastic example of Mike and Fish giving space to Trey and Page. Fishman gets into it for a bit at the 13:20 mark. He then gets right back into the groove. Great stuff! This section is very cool and much different from anything back in Europe. At 13:49 Trey and Fishman move to change it up. Trey starts to move from the ambient tone to more of his classic tone. Fishman begins to drive and this jam moves forward quickly. At 14:04 Trey lets the axe sing and the crowd erupts. Gordon continues to lay down a tremendous backdrop. Trey is dominating with really great notes. The ambiance created in the previous section really leads to the payoff in this section. At 14:50 the band moves back towards the ambient sections and Page gets heavy into the clav. 15:20 Fishman pushes the tempo a bit more, while the other three get into the funk. The jam slowly fades out after that. There are some great things about the first Ghost played on American soil. The 6:55-9:39 mark is some great full band jamming. I really love the ambient sections as well. This is a very unique Ghost, which helps the score. It is a smooth listen after the dozen times I have heard it. It does however, have a below average intro, and just doesn’t get to the level that the best Ghosts do. Tomorrow is Lakewood, Get ready! @KernelForbin has made a matrix (mix of SBD and AUD) that sounds fantastic. Going to be a great day at The Daily Ghost! open with an almost 20min version of a song that no one knows? Such a great way to debut it to the US crowd. As Jeffery mentioned,this Ghost and the rest of the tunes are polished and solid. The playfulness of Europe is gone. I also got the next night in Raleigh on tape with this show. I pretty much played both of them to death. The Raleigh show is one of my all time favorites. If for some stupid reason you’ve never heard it, check out the DWD->Mike’s in the second set. This show also has the best version of Taste, ever. EVER!!! !